These pens took the cardmaking world by storm when they were launched onto the market, and they have been around for sometime now. 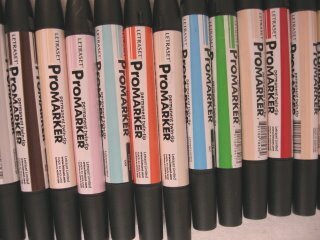 They are another brand of Alcohol Marker pens that are the grown up version of the felt tip pen. These are not the ones to let the children loose with ... oh! no! 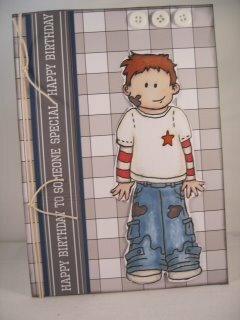 They were originally introduced for the professional artist but they are so easy to use that cardmakers everywhere have fallen head over heels in love with them. They are so versatile and they will give you the excellent results you want even if you can't, or don't like colouring in for your self. They come in a vast range of colours but the best way to buy them is in sets, and there are many to choose from. But don't think that the skin colours are just for coloring skin because some fantastic results can be achieved just from this group of colours. All of them blend together so easily, and the more you apply the colour, the deeper it goes, so one colour can be used to add shade and tone to your images. Both of these delightful wee boys have been coloured using these markers and the results look as if they have been printed out....and I am not a trained artist. But if you play around with the pens, experiment to see what you like and enjoy them you will see your work improving every time. But keep them away from the kids...these are just for you!